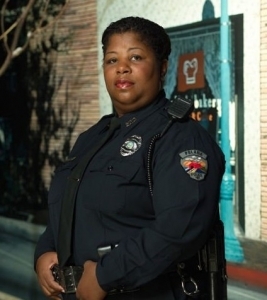 Cleo King ( Marcy ) is always playing cops now! Cleo King, in "The brotherhood of Poland, New Hampshire"
Have any of you noticed how our good friend Cleo King, AKA 'Marcy' from the beginning of Magnolia has been playing cops like non-stop lately. Her part in Magnolia had to have an influence on this. I will only be able to see her as Marcy now, going around impersonating bitchy cops, and I wouldn't want it any other way. She's finally getting her justice! This will be the place where we can report spotting of Marcy in a cop uniform or just talk about how much we love her in general. Re: Cleo King ( Marcy ) is always playing cops now! could you imagine if someday we see her arresting John C. Reilly? the audacity!? that scene was epic. so well written and timed, one of the funniest scenes pta's ever done. oh and will you look at that, someone uploaded it to youtube . i bet she told pta "hey you gotta believe me, i can play the cop in this scene, just give me a chance!" and then pta was all like "please just do your lines, do you wanna be in this film or not?" do you wanna be in this film or not?" lol@this thread i've never seen! i was off gettin hitched when P resurrecteded it back in june. it proved to be more gold involved. i didnt want to post in it coz the last one by ElPanda was perfect cap off (for now). it also made me for the brilliant Massuh title wont be used as often as it shouldve been (for now?). While I'd been watching the rest of the movie, I was considering if it served as inspiration for Magnolia with the theme of everyone being inextricably linked to each other. Maybe she was meant to play cops all along, and it was Paul who subverted her typecasting?